I love playing with hat crowns. When I’m designing a hat, I may knit swatches of the hat body itself, but mostly I’m going to be working on the crown decreases. In order to do that, I don’t typically need to knit the entire hat just so I can get to the crown. Instead, I cast on just before the decreases begin and just knit a crown. Depending on the decreases, it could come out domed or totally flat. 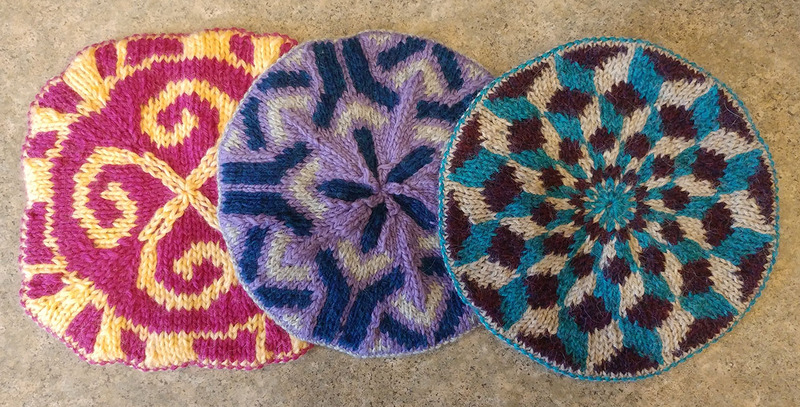 These three are, in order, the redesigned crowns for the Four Winds hat, the Struktur hat, and the Falling Blocks hat. It’s also kind of cool to note that they are (again, in order) 4-sided, 5-sided and 6-sided decreases. 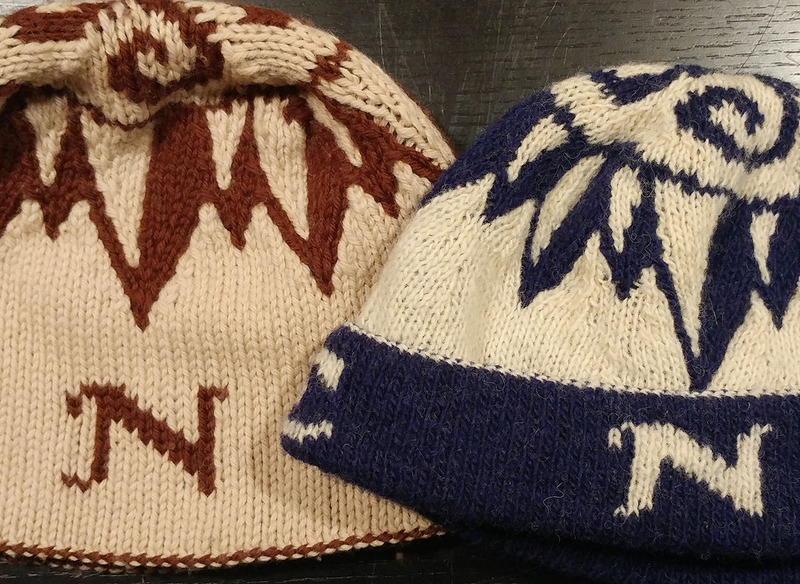 The Four Winds hat has been re-designed to work with sport weight yarn, but the crown in the photo is done in worsted weight — and no, it’s not in that color combo. I was testing the crown decreases, not the gauge or the yarn — I have only so much of the yarn for that hat, and at the moment it’s all with my sample knitter. The rest of the hat is going to be done in a completely different way from the previous version: because the resulting fabric is thinner, I can design it with a fold-up brim. The brim will have the two-pattern letters on it, which will be worked upside-down so that they are right-side up when the brim is in place. The compass points will be worked in an off-the-grid style that is cleaned up from the previously posted version. The letters and the crown have been completely redesigned from scratch. The Struktur hat has also been re-designed to work with sport weight yarn, and the resulting gauge is smaller so there are more repeats. I have also sized down the repeats themselves to add more flexibility in terms of sizing. The crown you see here is one possibility; it can also be worked with 6 repeats. I changed the color rotation for this version to what I consider to be a better, clearer version vs the original pattern. The Falling Blocks hat shows the most significant change from the original here: what you are looking at is the new inner crown. 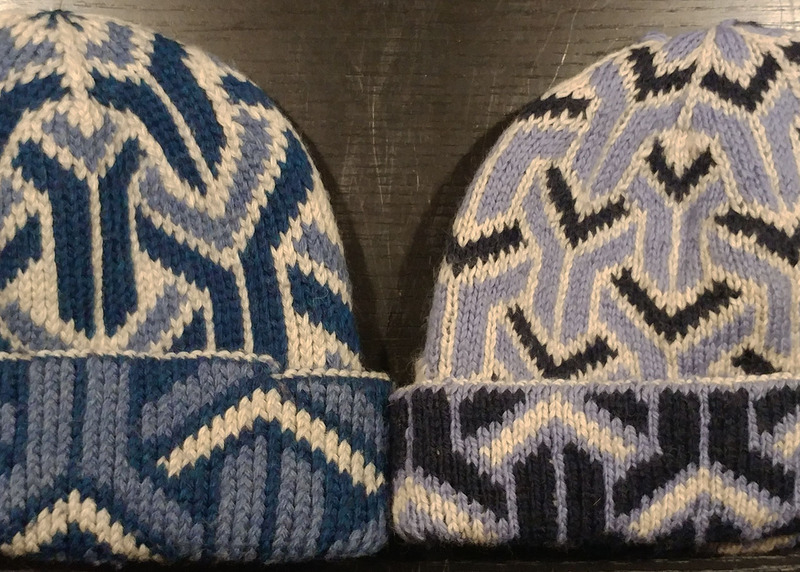 The original hat uses a different three-color pattern on each layer, but because I didn’t want to figure out how to decrease both patterns at the same time, I opted to cut off one pattern at a strategic location and switch to a single color-rotated version on the other layer. This always felt to me like a cop-out, so this time I decided to redesign the crown so that both patterns decrease at the same time. This required a different way of looking at the decreases — they have to occur in the same location, but they need not mirror each other. As with colors, in two-pattern charts, I have the freedom to tell you in which direction your decreases should slant on each layer separately. Also, like the other two, this hat has been redesigned to work in sport weight yarn. In case this is the first time you’re encountering these projects, you should read more on my website about my first book, Extreme Double-knitting, which I am in the process of reworking and reprinting. Sample knitting continues apace, although there has been little progress on the piece from the previous update while I’ve been working on redesigning other things. Now that 6 of the patterns are in the hands of sample knitters, three don’t require re-knits, one re-knit is done and one is in progress, all that remains for me to do is to do the highly onerous redesign of the Footsies to make more than one size, and re-knit two of the smallest and quickest patterns. Of course, then comes finalizing charts and the ever-present looming complete and total rewrite of the book (OK, maybe not complete and total … but significant). My Fall teaching schedule has begun with an appearance at a lovely oceanside campground in midcoast Maine. Last weekend I was at Fiber College, which is emphatically not a college, but has a unique laid-back atmosphere. Also, I got to camp out in a tent by the ocean! I hope to be back there next year. This past weekend I had a trunk show at Mind’s Eye Yarns in my home town of Cambridge, and next weekend I’ll be doing another at Ptown Purl in Provincetown, MA. If you’re in the area on Saturday from 12-3pm, visit to check out my samples in person and maybe buy a book or two? Coming up next in my teaching schedule will be an appearance at the Madison (WI) Knitters’ Guild on November 12 and 13. I’ll be teaching a series of workshops and then doing a guild presentation. As I understand it, this is one of the largest knitting guilds in the country and it is a huge honor to appear there. They seem to be excited to have me, and I hope I’ll live up to their expectations. I’ll be finishing my Fall season with a double-feature weekend, visiting the Yarn Attic in NJ on Nov 17 and Loop Yarn in Philadelphia on Nov 18-19. You can check out more details on my events calendar. I’m still finalizing my Spring schedule, so I’ll make an announcement about that later. I’ve got dates in NH, NY, CA and PA — if you’re interested in having me come to your area, feel free to get in touch. Lastly, I have had some conversations with other small online business owners and it seems like the issue I had with missing or damaged packages initially was probably more due to the time of year (December) than the services I was using. I have therefore decided to re-enable Media Mail as a shipping option. I will take it away for December only (returning to Priority Mail only) to keep my packages from walking away during the holiday season. If you’ve had your eye on one (or more) of my books but the shipping cost has been too high, today’s your lucky day! In the past month, I’ve made some knitting progress, and some planning progress. First, the knitting progress: I cast on for the redesigned version of the Whorl’d Tree shoulder bag, which will be done with the same yarn (Valley Yarns Northampton) but with some subtle differences. This is a 4-color, nominally-two-pattern piece (nominally because the second pattern is simply a solid color). 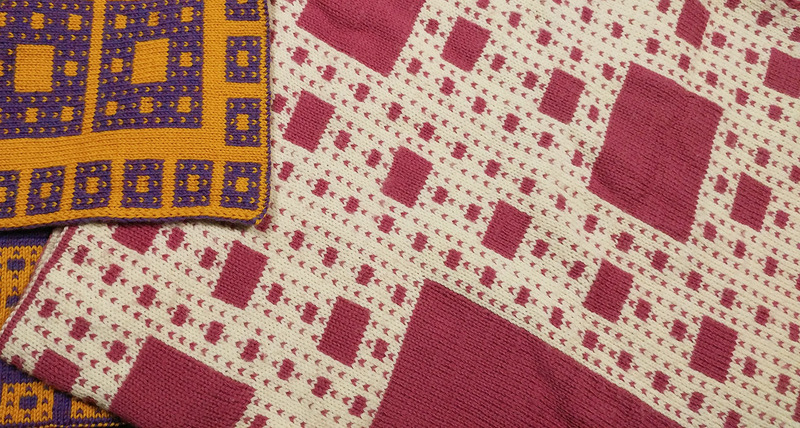 This means that the structure of the fabric is somewhat different than other double-knitting: instead of the fabric being locked together at every color change, this piece is hollow regardless of the color, except when the color on the two layers is the same in any given pair. In the original version, I chose Color A (the white background color) to be the interior color as well. However, when you get to the shoulder strap and flap, which are worked flat, this makes the multi-color linked pairs more difficult to execute. To get a more predictable edge solution, I chose to make the interior color Color B (the light blue). This is the only other color that shows up in every row (Colors C and D take breaks for entire rows/rounds), and also the only other color that’s light-colored enough to use inside the bag. Of course, this will change depending on what colors others choose. The issue is that, if you cut out the motifs in Colors C and D, there’s quite a lot of empty space between Color B motifs, which means that there’s more hollow space between the layers. So I’m going to rely on the properties of the yarn: Valley Yarns Northampton is a workhorse non-superwash wool, which should felt somewhat through use and perhaps a little during blocking. To make sure that happens, I need to make sure that both layers remain as close together as possible. To do that, I need to make sure that there’s not as much tension on the many strands inside the work, which will pull Layer 1 taut and cause Layer 2, which has no strands, to buckle outward. To help with that, I’ve introduced a new chart element which identifies the areas where one needs to be most careful about the length of your strand(s) and give them a little extra slack. It’s working tolerably well but we’ll see how it works in the long term. Second, the planning progress: In order for me to best use my own time, I need to have other people knit some of my sample patterns for me (for adequate compensation, of course) — and I will also have need of test knitters for some patterns that require more eyes and hands on them before they’re ready for prime time. 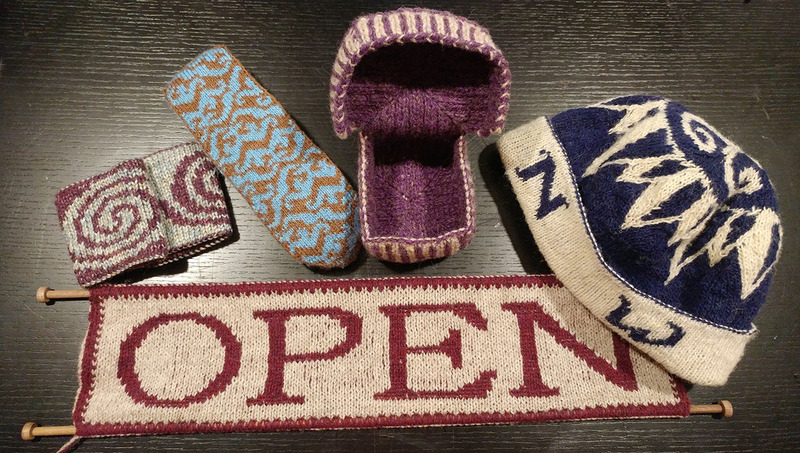 To this end, I’ve created a new email list for people interested in test-knitting or sample-knitting for me. This is something I probably should have done some time ago, but better late than never. The list, which was advertised primarily to my main email list, has a sufficient number of people — but if you really want to get on it, please feel free to contact me and we can talk. Still no progress on the actual rights reversion from Cooperative Press, but it may be due to a misunderstanding on my part. I’ve sent an email to try to clear that up, so perhaps there’ll be news on that front in next month’s update. Thanks for staying tuned! Last time I did book updates (for Double or Nothing), I counted down, month by month. This time I’m counting up — I’ll try to get on a monthly schedule but I don’t know how many months it’s going to be. Still, I want to give updates so that you know I’m working — and I’m guessing that some of what I’ll have to say will be of interest. 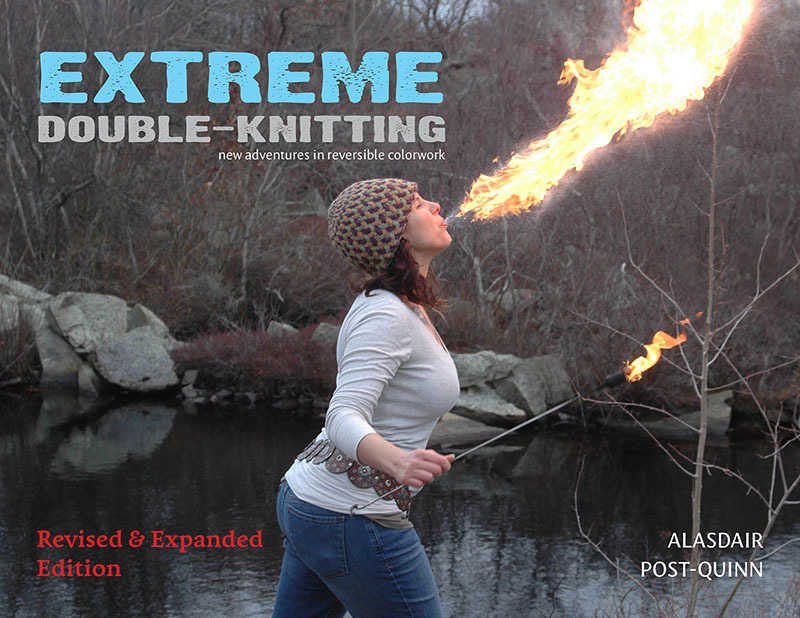 If you’re interested in getting on the mailing list for announcements when the new revision of Extreme Double-knitting is finally ready for ordering, please sign up on the EDK announcement list (and thanks!). I decided to begin my journey in reverse order, working on the most difficult patterns first just to get them out of the way. The one pattern I wasn’t sure I’d be able to do back when I originally wrote Extreme Double-knitting was the Silk Road necktie. It’s done in “off-the-grid” double-knitting which ensures that not a single stitch in the pattern is part of a vertical column. Strategically placed increases and decreases move the stitches diagonally to create a pattern of tiled spirals. In addition to the decorative increases and decreases, the necktie must also be shaped using increases and decreases. Not much of this pattern has been changed, but the yarn I originally used has been discontinued and I opted to re-knit the piece in the newly-chosen yarn. Unfortunately, the Jaggerspun Zephyr didn’t look as good in a single strand, so I doubled it and it looks much better. I’ve only got a couple more repeats to go and it’ll be done. 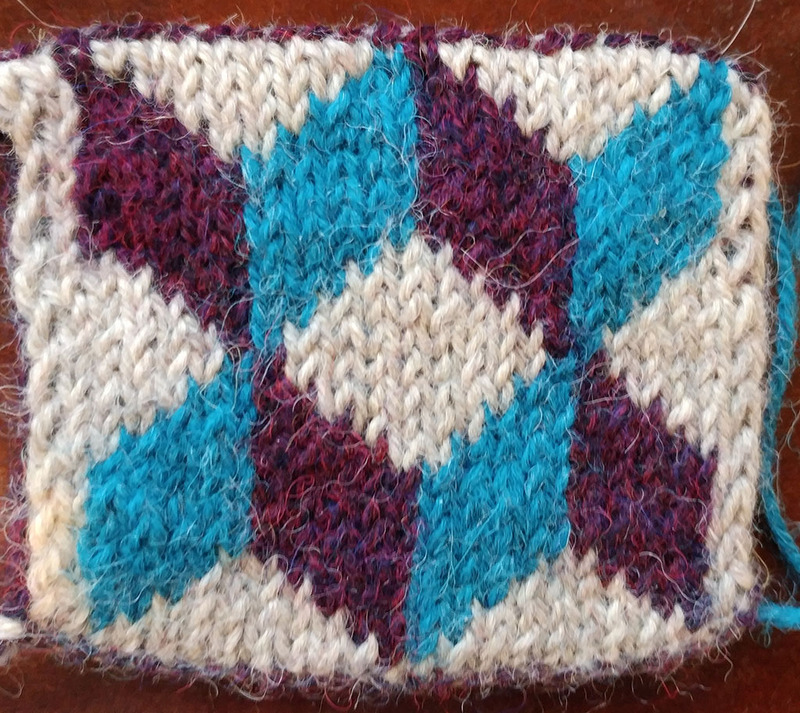 I’ve also chosen yarn and made swatches for three of the other pieces, with varying results. Four Winds was done in Cascade 220; I wanted to go quite a bit finer so I’m redoing the pattern in Briggs & Little Sport. Four Winds is actually in breach of contract with Twist Collective and shouldn’t even be in the book — so I’m going to redesign it completely. The finer gauge yarn (up 1 st/in from the original) will allow me to create different sizes without changing gauge or yarn, as I recommended for the original. There will be a flip-up brim with the letters on it (the letter pictured here is, clearly, not one of those that would be on the hat) to better show the reversibility, and the closure will be further refined to be less square. Struktur was also done in Cascade 220; I opted to stick with Cascade 220 here but use the 220 Sport for a lighter-weight fabric. The original three-color piece could stand up on its own, and was probably better suited for a bowl than a hat. The fabric was also done in twisted stitches, which I will be downplaying in the new revision. 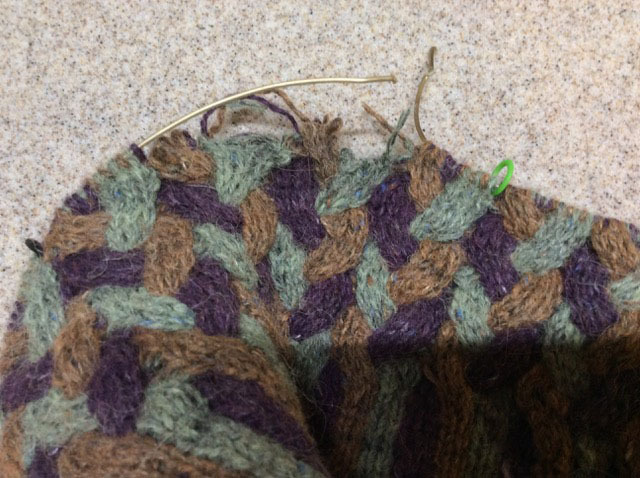 Without twisted stitches, the new gauge is also up 1 st/in from the original. This will require a redesign of the crown since the repeat will likely no longer be divisible by 4. Falling Blocks is one of the oldest patterns in the book, and was originally done in Berroco Ultra Alpaca. Berroco Ultra Alpaca Light is an option, so I swatched in that without the twisted stitches. Interestingly, this yarn behaved differently from the all-wool Cascade yarns above, and the swatch in finer yarn with untwisted stitches matched the gauge of the heavier yarn with twisted stitches perfectly. I will not need to redesign this pattern, but I still plan to do some work on it — I want to figure out an elegant solution to the closure so that I can actually decrease both patterns at the same time. Again, if you’re interested in hearing when the book is ready for preorder, you can keep watching this space (where there will be regular updates), but you can also join the EDK announcement list to be among the first to know. For more info about these and other appearances, visit my calendar. Updates will be coming soon. As I was finishing Double or Nothing, an opportunity was presented to me that I could not pass up. Cooperative Press has decided to clean house, and allowed its stable of authors to decide how we wanted to proceed with them. Having just committed to a self-published book which was going smoothly, I expressed interest in taking back the rights to my first book, Extreme Double-Knitting. Since then, there have been various delays — but I have been given at least a verbal confirmation that I will be getting my rights back for the book. The exact timeline has not been finalized, but I expect to be hearing from CP at some point in the near future. 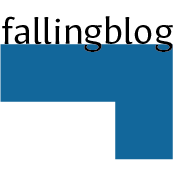 The plan is this: I will be taking the rights back for Extreme Double-Knitting and releasing a revised and expanded edition under my own Fallingblox Designs imprint. I don’t have a solid timeline on this project, but I expect it to take about a year. I will hopefully have something ready for next Spring’s big shows. Why a new edition? To put it simply, I’m not happy with the book in its current state. I made a number of decisions that seem strange to me now, and I have learned quite a bit since then. I’d like to incorporate my current knowledge and understanding of the subject matter (while keeping the substance of the book largely unchanged). In addition, there are several patterns which I would like to redesign for a number of reasons. It turns out that several of the yarns that I used are no longer produced or distributed in the US, and I will need to make new yarn choices. 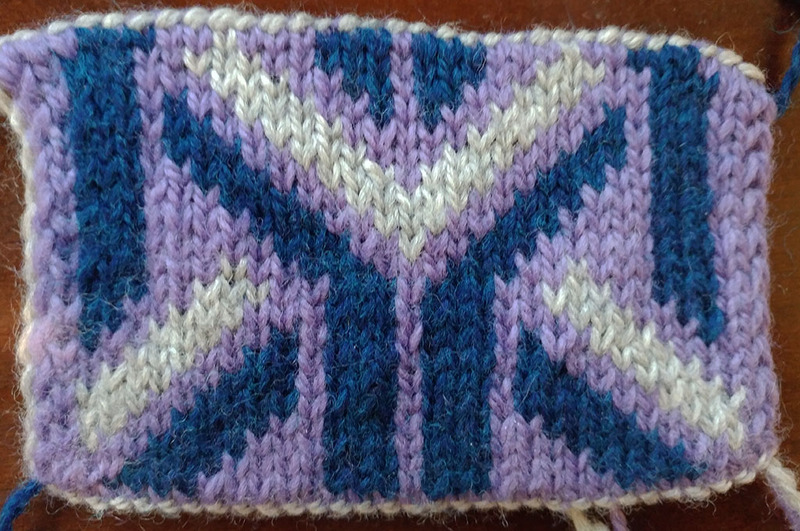 Some of the patterns were done in twisted stitches, an option which I’d like to play down. 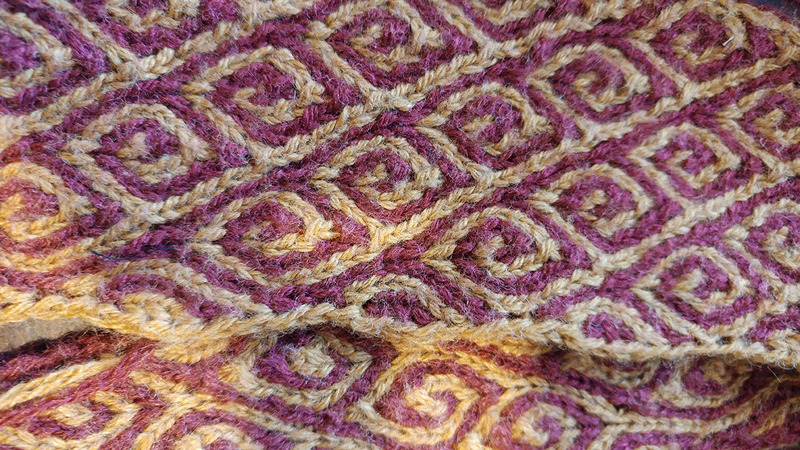 Some of the patterns were done in heavier-weight yarn than is ideal, and I’d like to redesign them in finer yarns. One of the patterns sorely needed grading, but I didn’t have the time. So there’s a significant amount of work; redesigns, new charts, new photos, revision of the text, new layout. I’d like to say it’ll take less time because much of the work is already done — but it’s still going to take a significant amount of time. I’m going to do something similar to the last book and begin an email list for announcements. This isn’t a preorder mailing list; I’m not using it to make decisions on how many to print. I’m just providing information. If you’d like to know when Extreme Double-Knitting is revised, expanded and ready to purchase, sign up on the mailing list today. I won’t be spamming the list with regular updates; for that stuff, come here or follow me on Facebook. One thing which I am concerned about is how to give an incentive to people who bought the book originally. Since I don’t have sales records, and probably won’t be able to get them, I have no way of giving a discount code to previous customers. I have some ideas of how to do this in the future, so I’ve put a “promo code” field in the signup form. There’s no use for that code field right now, but it might be useful in the future. I will try to post book updates on the same frequency as I did with the previous book project: about once per month, toward the end of the month. This will be the last “craftivist” pattern for a while — I’ve got other things I need to do, but this one was burning a hole in my brain and I decided to get it out. Shortly after I released Felis Hattus, a fellow designer got in touch with me and asked if I’d like to be part of a book of craftivist patterns. While the book didn’t pan out, I did come up with another pattern that might have been included. This one was, clearly, made for the March for Science later this month (in case it’s not clear, those motifs are resistors; pun definitely intended). As it turns out, I’ll be teaching at Yarnover that day, so I won’t be able to attend. In addition, I’m getting it out merely a week before that event, which isn’t enough time for anyone else to finish one before the event (unless you’re very, very fast, about 4x my speed). However, I think there will still be use for this kind of piece and the message it conveys even after the march. So a little about the pattern: It’s a double-knit scarf in 15 colors — but don’t worry, you’re still only using 2 at a time. 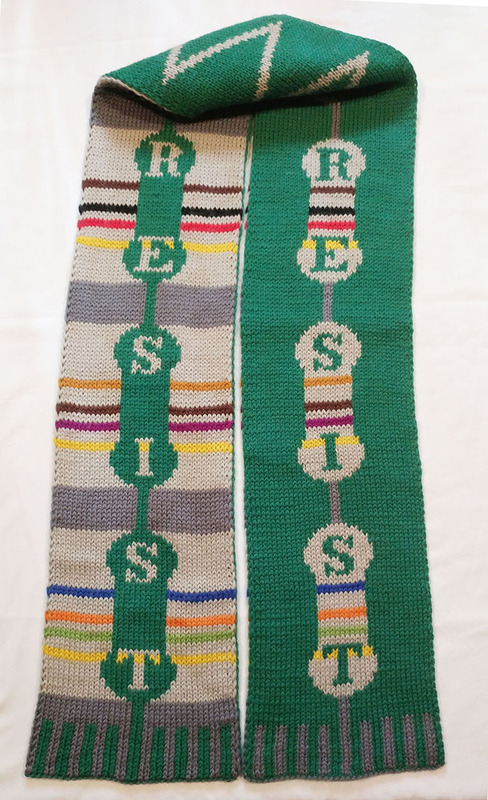 The lettering is done with two-pattern double-knitting so that the “RESIST” is visible on the other layer as well. Yes, the other layer isn’t quite as presentable; this is one case where there’s definitely a right and wrong side. But it’s still nice to look at and readable on the “wrong” side. Color B (the green background) stays constant throughout, but Color A changes between 14 other potential colors (not all 14 are used in this particular scarf, but they can be) to make the wire, the resistor bodies, and the color bands that denote what type of resistor each one is. In this case, I decided to make the second set of resistors identical to the first, but you could choose otherwise. In between the first and second sets (in the place that would probably go over your neck) there’s a resistor symbol as well. 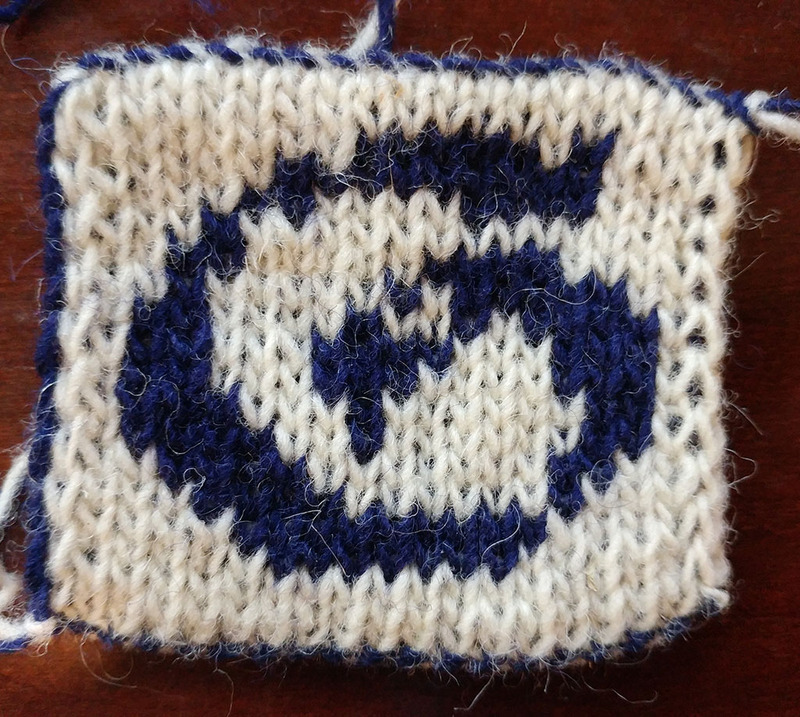 It’s called Resistimus, which is Latin for “we are resisting”, and you can download it on Ravelry. I used Universal Yarn Deluxe Worsted, but especially for the little bands you could just use scrap worsted wool of the right colors if you have it. Like Felis Hattus, this is a free pattern. I want people to use it in protests and any other way that helps the visibility of the movement to defend the sciences from the ravages of the Trump administration. With funding and other support stripped from science, environment, education and more, we approach the standing of a third-world country. Our momentum in innovation will only carry us so far; eventually all science and innovation will be the purview of mega-corporations who can fund scientists on their own for their own reasons, and education and the environment will be under the control of people who think the Bible is more important than textbooks and that prayers will save us from rising seawater and rapidly changing weather patterns. So I hope that if you like this pattern, you’ll do something to support STEM advancement, or at least donate to one of the organizations fighting the Trump administration’s policies.